Frankfurt is known to have two faces; the one face is the cutthroat financial capital of Germany. The other face is the one of a civilized place, which spends more time on the Arts. It is the smallest of Europe's big cities. Frankfurt is known to be the only city in Germany to have a skyscraper skyline. Frankfurt am Main may be the smallest of Europe's big cities, but it's certainly not lacking in stature. Throughout its 1,200-year history, the city has been linked to international trade, commerce and transportation. 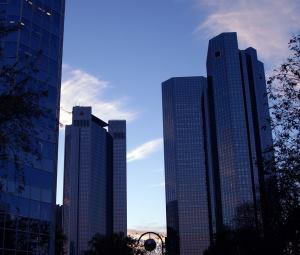 Today, with more than 400 international banks and an active stock exchange, Frankfurt has the only skyscraper skyline in Germany. With the arrival of European monetary union, the city is playing a leading role as the home of the European Central Bank. And with the continents largest airport and busiest train station, Frankfurt is without question the transportation hub of Europe. The city has acquired a dubious reputation as a dull, business-minded place. Indeed, many people who fly or ride the rails into the city are simply making a connection or attending a trade fair. Other travellers linger, however, to sample Frankfurt's fine opera, ballet and world-class museums. In 1999 there's a special reason to stay: a yearlong celebration of the 250th anniversary of the birth of Goethe, Germany's leading literary and intellectual figure, who was born in Frankfurt 28 August 1749. With this page we would like to present you with the opportunity of acquainting yourself with the history of Frankfurt am Main. The timetable offers a summarised historical overview. Important milestones of the city's history can also be found in the comprehensive Frankfurt chronicles. City development and city politics are never far from one another. Those interested in the present "government" of Frankfurt - i.e. information on the city council, municipal authorities, the communal elections or Frankfurt's mayor - will find these pages to their liking. According to archaeological discoveries, people lived in the area of today's Frankfurt city area at least 3000 years before Christ. Even before Christ's death, grain was planted on the so-called "Cathedral Hill," the area today bordered by the Römer and the Cathedral. A little later, the area was settled, which the remains of wooden structures verify. Until the end of the eighth century, the Cathedral Hill was a small island protected by water, swamp and moor. For the prehistory of Frankfurt - which includes the phase of Roman occupation - there are no written histories available. However, one thing is clear: Around the time of Christ's death, the Romans conquered large parts of Germania. Part of these occupied areas also included the Rhine-Main area after 83 AD. Not far from Frankfurt, in Nida west of Heddernheim and Friedberg, Roman castles were built. A type of military supply base was located on Frankfurt's Cathedral Hill. This, as well as the castles, lost its function when the Roman garrisons were transferred to the Limes in 110 AD. After the departure of the legionaries and the demolition of the military structures, a civilian settlement emerged again on the hill. Evidence from this time can be seen in the Frankfurt Museum for Pre- and Early History. In the third century, the influence of the Romans declined in Upper Germania. Following the Alemanni, it was the Franks who ruled the area on the lower Main around 500 AD. On the Cathedral and the Karmeliter Hill to the west, Frank settlements emerged. The reason for the growing settlements was probably the Main Fort. It was suitable as a transportation route, because at the time of the Franks, one could easily wade across the Main. What once only indicated a river crossing would, thanks to Charlemagne, later become the name of the area: "Franconovurd". In one of Charlemagne's deeds of dedication from 794, the first reference by name to Franconovurd can be found. In the same year, the ruler of the Franks invited holy dignitaries to Frankfurt for a synod of the realm. Up until recently, history books assumed that before this notable date, Frankfurt was an insignificant, small provincial hole with a couple of wooden buildings and a wooden church. But the latest, spectacular discovery in the Kaiserdom corrected this perception. In 1992, archaeologists discovered in the floor of the St. Bartholomew Cathedral a wooden chamber grave of a noble's small daughter and the wall of a stone church from the Merowinger Age, the years between 650 and 720 AD. The precious grave relics, the gold and silver jewellery of the small girl as well as the church of stone document this fact: Frankfurt must have been an important area with a potential for power and money much earlier. This may also explain why Charlemagne specially chose this locale for his shining assembly. Ludwig the Devout erected a representative structure of plants, a �alatium� after his death. In the ninth century, Ludwig the German, the son of Ludwig the Devout, handed out the contract to build Frankfurt's Palatinate Church St. Salvador. This was built on the walls of the old Merowing stone church, a fact known since the discovery of the "Golden Girl", and it was later rebuilt as the gothic church St. Bartholomew, the cathedral. In 855, Frankfurt experienced its first election of the king. Lothar II was selected German ruler on Franconian soil. From this point on, Frankfurt remained an arena for imperial politics and the elections of kings for centuries. Between 855 and 1792, 36 kings were elected here, and 10 of them were later crowned Kaiser. During the Staufer Age in the 12th century, Frankfurt rose to prominence as the permanent election place for German kings. The Golden Bull of Karl IV wrote this into the imperial constitution. The city was officially declared as the location for electing kings. From then on, the Bartholomew church was regarded as a point for magisterial ceremonies. The first crowning of a Kaiser, Maximillian II, was held here in 1562. The last Kaiser who allowed the crown to be placed on his head in the "Kaiser Cathedral" was Franz II in 1792. Even though the city became a favourite stop for secular dignitaries over this nearly thousand-year-long epoch, the governing headquarters of the leaders was always outside of the Rhine-Main area. Under the Carolingian, Saxon and Franconian Kaisers, Frankfurt is still not a city, but a fortified king's palatinate. An overseer controls it until 1220, when a mayor takes charge of administration. Both the overseer and the mayor have the task of representing the king in his absence. Under the Staufers (1138-1254), Frankfurt develops into a city. Long-distance travel and trade bloom, the population grows and the city expands. A new city wall becomes necessary, which leads to the still visible Staufen Wall. Directly on the Main, Konrad III orders the construction of the Saalhof with the Saalhof Chapel, which is still there today. During this period, the terms "oppidum" (city) and "cives" (citizens) emerge for the first time. In 1254, at the end of the Staufer dynasty, Frankfurt becomes increasingly independent. The city joins the Rhine Union of Cities, which is designed to ensure the peace of the empire. In 1266, along with the mayor and the legislative lay assessors, the council develops into a new administrative organ. In 1311, Frankfurt receives its first self-administration, albeit a limited one. Two lord mayors replace the mayor and take control of his administrative functions. In 1372, the council is able to acquire the mayor's office as well as taxes and imperial possessions pledged by the Kaiser, thereby securing further autonomy for the city. From now on, it reports only to the Kaiser, the ruler of the empire. Frankfurt becomes an independent, direct imperial city. Frankfurt's development into a city is closely connected to the evolution of the Frankfurt Fair (Messe). It is first mentioned in a Jewish manuscript in 1160. In the 13th and 14th centuries, Friedrich II, Ludwig the Baier, and Karl IV especially promote Frankfurt's rise to a European trading centre. They grant the city numerous privileges, which also work to safeguard the Frankfurt Fairs. As a result, the old Autumn Fair and the new Fast or Spring Fair officially sanctioned by Ludwig the Baier in 1330 develop into a junction for long-distance trade. While the old Autumn Fair primarily offers freshly harvested natural products from the area, the new fair in the spring serves as a market for wine, raw materials and manufactured goods. Frankfurt is known at this time as the "department store for Germans". The city and its population (8,000-10,000 residents) grow with the economic upturn. Around 1480, the Book Fair becomes a solid component of the Frankfurt Fair. It takes place, like many other fairs at the time, on the Römerberg. With an office for book printing around 1530, Frankfurt becomes one of the most important printing cities in Germany and one of the largest centres for books in Europe. That Frankfurt could develop into such an important place for fairs is mainly due to the important trade routes that travel through the city on the Main. Well into the 19th century, Frankfurt is rocked by disputes between the patrician council and guilds and the citizenry, both of whom were seeking participation in government. Since the beginning of the 14th century, the council comprises three banks. Of these, the lay assessors and the "community" (nobles, academics and rich business people) claim the first two benches. The guilds-though just those "able to join the council"-occupied the third bench. Thus, most of the population has no influence on the political decisions of the city government. The discontent erupts in the first unrest in 1350 and 1366. But without success-the guilds continue to play an subordinate role. In 1613 and 1614, things boil over in an uproar. Named after the Lebküchen baker Vicenz Fettmilch, the "Fettmilch Revolt" ended with the execution of the rioters. Further conflict between the council and elements of the citizenry showed itself at the beginning of the 18th century. It ended between 1708 and 1732 as constitutional argument "Frankfurt v. Frankfurt" in front of the Kaiser. Once again, basic changes were left out. The privileges of the patricians were first abolished in 1816 with the free city constitution. From now on, anyone who is a citizen of Frankfurt-and has a minimum reserve of 5,000 guilders-can be elected to the council. In the 13th and 14th centuries, religious fanaticism on the part of Christians leads to the annihilation and eviction of the Jewish population. Between 1461 and 1463, the city erects a sealed ghetto outside the Staufer Wall, where Frankfurt's Jews are relocated on recommendation from the church and under orders of Kaiser Friedrich III. As of 1520, the Reformation gains more and more followers in the city. In 1521, Martin Luther stays the night in Frankfurt on his way to the Worms Reichstag. Reformational sermons are held for the first time between 1522 and 1524. The Frankfurt Council tends to sympathise with these new teachings, but tries to dam pressure on the Mainz archbishop. This results in a religiously, socially and politically motivated revolt of the guilds against the patrician's city regiment and the traditional clergy in 1525. After polling the citizens, the council officially introduces the Reformation to Frankfurt in 1533 and outlaws public Catholic services. In order to withstand the Catholic opposition, in 1536 the city joined the League of Schmalkald, an anti-Kaiser religious defence union. After its wartime defeat to Kaiser Karl V, Frankfurt returned to the Kaiser's camp. The city becomes one of mixed religions, which is officially established through the empire by the Augsburg religious treaty. From this point on, religious refugees stream in from the Netherlands. They quickly make up a fifth of the population and decisively mark Frankfurt's economy in the years to come. Judengasse between 1711 and 1721 as well as the "Christian Fire" in 1719 destroyed major sections of the city. During the reconstruction, new building architecture appears. This lends the city a different face in line with the tastes of the times. House numbers and street lanterns are introduced street paving is improved. This occurred according to encouragement of the French occupiers, who first took Frankfurt during the Seven Year's War (1759-1763). Further French occupations followed in 1792, 1796, 1800 and 1806. In 1749, Frankfurt's most famous citizen, Johann Wolfgang von Goethe, is born. His birth house in Großen Hirschgraben can still be viewed today. The great prince of poetry described his childhood in Frankfurt and his experience during the French occupation in the book "Poetry and Truth" (Dichtung und Wahrheit). Increasing public awareness around 1750 leads to a time of distinct patronage in the city. An excellent example is the foundation of doctor Johann Christian Senckenberg, who put up all his assets for a institute for natural sciences and medicine and a public hospital. There were also major community events in this century. Above all, the last coronations of the Kaisers in 1711, 1742, 1745, 1764 and 1790 as well as the corresponding celebrations in the Kaisersaal of the Römer are part of them. The chapter of "The Kaiser City on the Main" closes with the coronation of Kaiser Franz II on July 14, 1792 because the Holy Roman Empire of German states ends in 1806 with the Napoleon's Rhine Union and Kaiser Franz II's renunciation of the crown. Frankfurt loses its status as a city of the empire, elections and coronations. After the war and victory of Prussia over Austria, the German Union is dissolved in 1866. Frankfurt loses its autonomy, is annexed by Prussia and added to the province of Hesse-Nassau. Frankfurt is placed under the king's government in Wiesbaden as a city parish. Two mayors are now at the top of the city government: One elected by the city council and the other confirmed by the king. The magistrate and the city council externally represent the city. In 1871, after the peace treaty with France is signed in the restaurant "zum Schwan", Prince Otto von Bismarck voices his hope that the "Peace of Frankfurt" will also mean peace between Prussia and Frankfurt. And, in fact, Frankfurt quickly rises to become a major city. It develops into a modern industrial and trading area with cosmopolitan flair, especially during the term of Lord Mayor Franz Adickes, 1891-1912. The first incorporation of outlying villages leads to a expansion of the city area. Residential and industrial areas are formed, as are green belts, public parks, ring and radial streets. Important projects begin, including the Palmengarten, the Frankfurt Opera, the train station, the west port as wells as a communal supply system. Lifted by the general boom of the foundation years, the city blooms with numerous exhibitions and major events. In 1909, the first international airship exhibition (ILA) takes place in Frankfurt. Adlerwerke, founded in 1880, develops into a leading producer of bicycles, typewriters and automobiles. Other companies also profit for the economic situation. Frankfurt is doing well, and the population grows from 78,000 (1867) to 437,000 (1917). The city also moves ahead in cultural and scientific activities. Once again, rich Frankfurt families call important institutions to life. Their generosity peaks in 1914 with the opening of the Frankfurt University, the first university in Germany funded by donations. It carries the name of Johann Wolfgang Goethe since 1932. Frankfurt is the target of 11 air raids during WWI. The population especially suffers under scarcity of food and fuel. The winter of 1916-1917 goes down in Frankfurt history as the "Winter of Swedish Turnips." The November Revolution of 1918 also leads to the formation of a worker and soldier's council. This however has only limited influence on the city government and discharged in 1919 after a period of unrest. Following riots in the Ruhr Valley, the city becomes a military pawn and is occupied by French troops from April 6 to May 17, 1920. The uncertain political and economic situation as well as the increasingly faster rise in inflation promotes political radicalism. Radical right and ethnic groupings also form in Frankfurt. A period of economic stabilisation begins with the introduction of the bond market in 1924. In 1925, the Frankfurt architect Ernst May is selected to be the city construction manager. Under his leadership, the first large German settlement, the "Römerstadt" on the shores of the Nidda is built from 1927 to 1929, and architectural history calls it the "Frankfurt Example". The Waldstation, the largest German sports stadium, is built. But this upturn does not last for long. There are some 70,000 unemployed in the city at the beginning of 1933. In the same year, the number of residents is about 550,000. The disastrous economic situation supports the radical right parties. The NSDAP quickly becomes the strongest party in Frankfurt. Between 1929 and 1933 its share of the communal and Reichstag elections climbs from barely 5 percent to 47.9 percent. After the community elections on March 12, 1933, the National Socialists take over power in the Römer and begin with "synchronisation". On April 1, SA troops boycott Jewish shops. Nazi students and SA men also occupy the university and its institutes. The Jewish Lord Mayor Landmann flees. Numerous Jewish and non-Jewish public workers have to quit their jobs. The Rhine Main Airport is built in 1936 to replace the Rebstock Airport, which cannot be expanded. In 1938, the contemporary section of the city art gallery in Städel is closed. Works by "degenerate" artists are confiscated and auctioned off outside the country. The same year, the anti-Jewish acts of terror reach new levels. Synagogues, homes and business also burn in Frankfurt during the Reichspogromnacht. With the beginning of the war, the repression of the Jewish population is exacerbated. In 1941, the deportation of Frankfurt's Jews begins. A total of 10,000 people are transported and killed in the ghetto of Lodz until 1944. Frankfurt first becomes a target of major allied air raids in the autumn of 1943. Residents experience the worst air attacks in 1944. On the March 18, 22 and 24, the historic old city and the city centre sink in rubble and ash. Ninety thousand homes are destroyed, 1,870 people die and 180,000 are left homeless. American soldiers march into the city on March 26, ending the Nazi dictatorship and World War II for Frankfurt. Frankfurt offers many fine operas, ballets, and museums. There are a few sites to visit in Frankfurt. You can go see the Goethehaus and the original carvings inside the Keiserdom. If you are more into museums, you will have to go to the Stadel gallery to see the paintings from German, Flemish, and Italian Masters. For late night fun in Frankfurt, you will enjoy barhopping in Sachsenhausen. If you are one that enjoys walks, you will enjoy walking through exotic plants in the Palmergarten. You can also walk along the banks of the Main to view the boats and bridges of Frankfurt. Frankfurt has been a flourishing trade centre for more than 750 years. Today it attracts millions of visitors to a large number of important international fairs. Some of these fairs are the Frankfurt Book Fair, the International Automobile Show, the Achema and others. Frankfurt has over the years become the centre for modern telecommunications. Its central location and well-developed service infrastructure make Frankfurt one of Germany΄s leading communication centres. Also located centrally in Frankfurt is Johann Wolfgang Goethe University. This University has one of the highest percentages of foreign students in German Universities. Frankfurt am Main is the city of the International Book Fair, the National Library, a city encompassing an astounding variety of publishing houses, libraries and bookshops. The literary metropolis Frankfurt am Main is also the birthplace of Germany's most famous literary figure, Johann Wolfgang von Goethe. In its museums, its public exhibition halls and art galleries, Frankfurt am Main also displays its own distinct style of contemporary and historical art and culture, ranging from the antique sculptures to the Museum of Modern Art's semi-annual Change of Scenery exhibitions. Frankfurt's high-rises form a part of the city's identity. The skyline is truly unique, thanks to its extraordinary architectural blend of tradition and modernity. Europe's largest skyscraper is also situated here, the 259 metre-tall Commerzbank building. The city is home to one of the world's finest ballet ensembles and its choreographer William Forsythe - Frankfurt hosts international guest performances of the highest level on a regular basis. At the same time, Frankfurt am Main is a metropolis for techno and dance-floor music; names such as Sven Väth, Marc Spoon or Sabrina Setlur have lent the city a reputation of musical magnetism. With the appointment of William Forsythe as artistic director in 1984, the former Frankfurt Ballett received a new name: Ballett Frankfurt. Forsythe developed a new structure and his own repertory with a unique style, which enabled the company to establish itself not only in Frankfurt but also far beyond the borders of the city with performances all over the world. Ballett Frankfurt currently employs 34 dancers, 3 ballet masters and 28 people in the technical and administrative area. In 1989, Ballett Frankfurt became an independent branch of the Städtische Böhnen, run by two directors: William Forsythe (artistic director) and Martin Steinhoff (managing director). In 1999 William Forsythe became general director. In 1996 William Forsythe was named artistic director of TAT (Theatre am Turm), a theatre housed in a converted tramway in Frankfurt. In January 1999 Forsythe became general director of TAT in addition to Ballett Frankfurt. Main residency of Ballett Frankfurt is the city Frankfurt am Main, with 650,000 inhabitants, centre of the highly industrialized Rhein-Main area. In Frankfurt, the ballet gives about 50 performances a year. The former theatre buildings, opera house, playhouse and chamber theatre were destroyed during World War II. They were rebuilt in the decades after the war and combined into one theatre complex, which now comprises an opera house (1369 seats), a playhouse (712 seats) and a chamber theatre (192). In the night of November 11 to 12, 1987, the opera house burnt down and the ballet could only perform on the playhouse stage. The reopening of the opera house took place on April 6, 1991 with an opera premiere, followed by a ballet premiere on April 7, 1991. The ballet currently performs on the opera stage as well as on the stage of the playhouse. From October 1999, the company will be performing at TAT, where Forsythe will develop new site-specific work. The city's numerous theatres and theatre groups, the opera and the concert house Alte Oper offer Frankfurt's stage aficionados and lovers of fine arts a comprehensive and diverse programme. It is often the fine and subtle distinction that can move the world, and turn an event into an experience. You will encounter such distinction at the Alte Oper Frankfurt Concert and Conference Centre: everything is just a little bit more poised, more perfect, more impressive. The unique setting, the special flair, the history and the central location provide the Alte Oper Frankfurt with its unmistakable image and ensure any event an unforgettable character. The Alte Oper Frankfurt is more than a conference centre. As a focal point for art and culture, it unites the traditional and modern styles with lifestyle. The ambience is sure to make a lasting impression on your guests. The importance of seasoned marketing concepts to ensure conference success is not a revelation to you - and you act accordingly: tailor-made solutions have made the Alte Oper Frankfurt famous .far beyond the Rhine Main region. Over 80 organisers choose the festive atmosphere of the representative rooms and salons every year. The Great Hall is as flexible as every other part of the building, transforming itself to suit any occasion: The European Central Bank chose Frankfurt as its location and the Alte Oper as the venue for the ceremony. International corporations use this as a backdrop for presentations to major audiences. Exhilarating ball evenings captivate visitors at the annual German Sports Press Ball and the Opera Ball. From press conferences to award presentations, annual meetings to conventions. The imposing atmosphere at the Alte Oper Frankfurt guarantees success.